Michael O’Brien (1791-1871) set up a Classical School in the townland of Ardbear, just outside Clifden, at the junction of Roundstone Road and the lane leading to the Rugby pitch. Michael was a Classical Scholar from Ennistymon, County Clare, and a cousin of Lord Inchaquin of Dromoland Castle. Michael married Anne Smith (1804-1898) from Oughterard, Co Galway, circa 1825. According to the Parish of Omey records, the O’Brien’s lived in Post Office Street, (Seaview), Clifden, in 1855. Michael and Anne had seven children, all very well educated for the time; John, Lucius, Mary, Honora, Ellen, Michael, and Charles O’Brien. The O’Brien’s eldest son, John, born in Clifden circa 1827, emigrated to Melbourne, Australia. Letters home, still held in the house in Seaview, show that, because of his Classical Education in Clifden, by 1853 John had become Inspector of Schools for Melbourne. The second son, Lucius (c.1829-c.1907), went to New York, where he was robbed of his money, and joined the Army as a common soldier. As this was infra dig for a Gentleman, he used the false name of Lucius Smith. He was commissioned to the rank of Captain in the Field during the American Civil War, became a career soldier in an Artillery Regiment, and retired as a Colonel, under the Army approved name of Lucius Smith O’Brien. The O’Brien’s eldest daughter, Mary O’Brien, born circa 1833, married William Neyland (1830-1870) in Clifden. On the death of her husband, Mary emigrated to Boston in 1871 along with her eight children, where she remarried and had two more children. The O’Brien’s youngest daughter, Ellen (1838-1919), met and married a builder from Clare, Thomas Emerson. 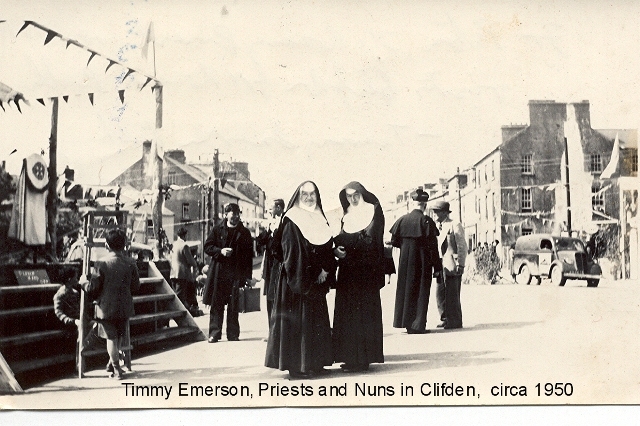 They were married in Clifden in 1855 when Ellen was 17 years of age. The Emerson Family traces it history back to William Emerson (c.1600-c.1650) who came from Bedfordshire in England to Corofin, County Clare, circa 1630, and settled there before the time of the Cromwellion Plantations. Thomas (Tom) Emerson (1831-1902) [Ellen O’Brien’s husband] came from Corofin, County Clare. His father, John Emerson (c.1795-c.1860), was a builder in Corofin, where he lived with his wife Mary Dickson, and where they had at least five children. Although a Catholic, Tom had been baptised in the Church of Ireland in Corofin, and as a builder he did most of his work for Church of Ireland clients. At that time it was not always possible to have the birth and baptism registered in the Catholic Church, as Catholic Churches were very few in number. It was also the norm at that time for the sons to be brought up in the father’s religion, and the daughters in the mother’s religion. Tom set up as a builder in Clifden circa 1852. He married Ellen O’Brien in 1855 and they had ten children; Annie, Michael, Mary, John, Henrietta, Susan, Thomas, Nora, Kathleen, and Charles. Tom had a brother John (1824-1912), who was also a builder and had worked on the restoration and remodelling of Ashford Castle. Tom and John had arranged for John’s eldest son, Geoffrey Roberts Emerson, to go to Clifden and to marry Tom’s eldest daughter, Annie. However, when Geoffrey Roberts met Tom’s six daughters in Clifden he fell in love with the second daughter, Mary, and married her instead in 1882 when she was 19 years of age. Geoffrey Roberts and his wife Mary Emerson (1863-1943), known as “The Mater”, lived first in Nollie Lee’s house on the hill in Market Street, but later lived in Roundstone for five or six years in the late 1800’s. While living in Roundstone Geoffrey R. built the Estate House in 1895, now extended and known as Cashel House Hotel and presently owned by his granddaughter, Kay Emerson McEvilly. This house and its gardens were to his own design and were considered particularly good. Geoffrey R. also built Cashel Church and a number of other Estate Houses in the Roundstone Parish area. 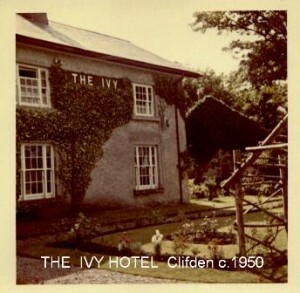 On returning to Clifden in the early 1900’s, Geoffrey R. and Mary purchased “The Ivy” at the Waterfall, as their home. 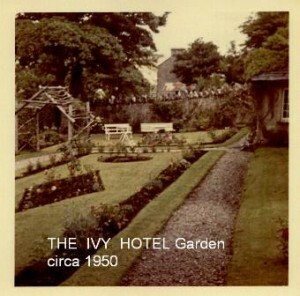 “The Ivy” was said to have been built by the original builder who built Clifden Castle, and this may well be true. Geoffrey R. built a number of houses, rebuilt others, and carried out maintenance work on the Convent of Mercy School and orphanage in Clifden in the early 1900’s. Brian Mahon’s Terrace, next to the Clifden workhouse, was built for soldiers who had survived the First World War and its construction was supervised by Geoffrey R.
Geoffrey R. and his wife Mary, ‘The Mater’, had seven sons and two daughters, Jack, Ray (short for Geoffrey), Thomas, Mary Josephine (Moddie), Timothy, Leticia, Louis, Francis Joseph (Frank), and Sydney. 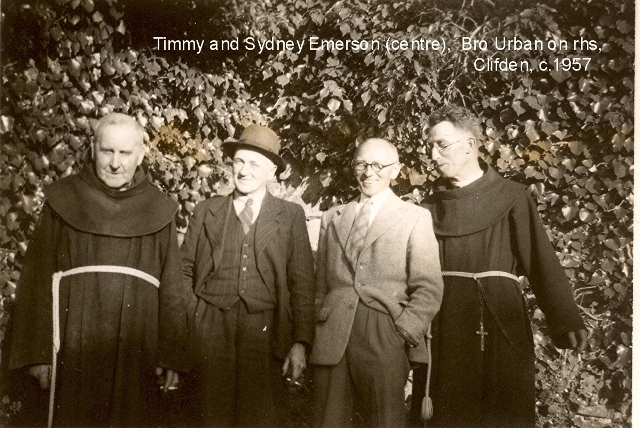 Most of their sons worked as builders; Tom in Melbourne, Australia, Ray and Louis in New York, and Timothy (Marie Emerson Brennan’s father) in Clifden. After Geoffrey R. died in 1921, ‘The Mater’ and her daughter, Moddie Emerson, established The Ivy Hotel and ran it as a hotel for many years. 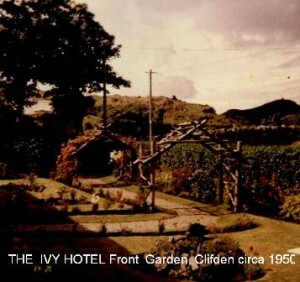 The first Motor Car to come to Clifden was owned by a Dr. Petherbridge, a Botanist from London University , who stayed (circa 1920+) in The Ivy Hotel when he came on his regular visits to the area to study fauna in the bogland between Clifden and Roundstone Hill. Geoffrey R.’s fourth son, Timothy Emerson (Timmy), took over his father’s Design and Building Practice in Clifden and lived with his wife, Annie Barry, in the house in Seaview that was originally owned by his great grandfather, Michael O’Brien. Timmy restored and renovated the house in the Nineteen Thirties, and his daughter, Marie Emerson Brennan, continues to live there today. 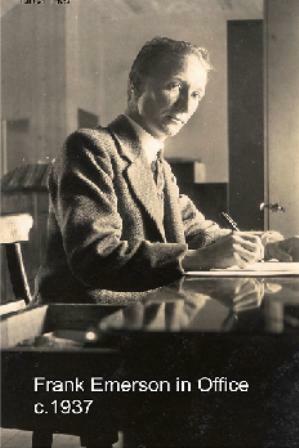 Frank Emerson, the sixth son of Geoffrey R. and ‘The Mater’, was the Manager of the Employment Exchange in Clifden for many years. The area he serviced included most of Connemara and the islands, and he claimed it was the largest Employment Exchange area in the country. As a boy Frank witnessed the spectacular arrival of Halley’s Comet in May 1910. This comet returns to our Solar System every 76 years, but its next visit in 1986 was far less spectacular due to cloudy conditions. On the 15th June 1919 he watched the Alcock and Brown plane circling Clifden after its flight from America, looking for a place to land before it landed in the bog where he inspected it later that day near the Marconi Station which he frequently visited. Frank’s son, Geoffrey J. Emerson, and his grandson, Geoff Emerson, carry on the family tradition. Both are Civil Engineers and work as Consulting Engineers in the company of Clifton Scannell Emerson Associates in Blackrock, County Dublin, and have been responsible for construction projects throughout Ireland. 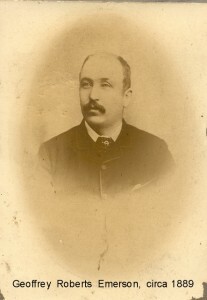 Charles Emerson was the youngest brother of Mary Emerson (The Mater) and a son of Thomas Emerson and Ellen O’Brien. Charles became Head Master of Monaghan Vocational School, and was a Commandant in the Old IRA. He died in Clifden in 1921, after his release from Belfast Jail, as a result of a hunger strike there in which he had participated. A huge Military funeral of five Companies escorted his remains to the Emerson plot in Ardbear Cemetery, Clifden, and was described in detail in the Connaught Tribune at the time. Note: Most of the above named persons are buried in Ardbear Cemetery and are named on the family Headstones. I’ve been searching for a Daniel Emerson born to a William and Catherine abt. 1798 in Dublin, Ireland. Can you help ?